When robins build a nest on the window ledge at Tressa's Grandmother’s house, Tressa is thrilled, and also concerned. What would happen to the pretty blue eggs laid by the mother robin? In The Legend of the Easter Robin, Tressa watches the robins caring for their eggs, visits with Grandma and learns how to make bird eggs to hang outside on Easter morning, learns how our Heavenly Father cares for the birds, and learns about the legend of the Easter robin (an old Pennsylvania Dutch tale about how robins developed their red breast after one bird had an encounter with Jesus). 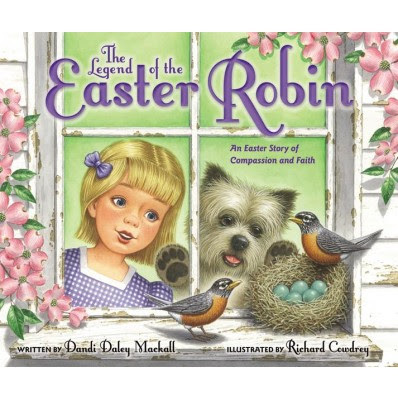 It is a sweetly illustrated book, and would be an interesting and creative Easter story to share with your child, teaching them about compassion and faith. For your chance to win a copy of this book, please use the entry form below. Entries will be accepted until Saturday, February 27, 2016 at 8:00 p.m. CST. Must be 18 or older to enter. One entry per mailing address.